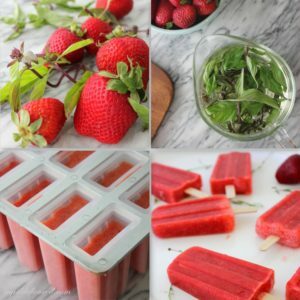 When it gets too hot to function, these strawberry basil paletas are sweet, refreshing relief - and they only take four ingredients to make! In the blast-furnace summer of Central Cali, Strawberry Basil Paletas are just what y’all are needing! Hell’s bells…it’s HOT in these parts! It’s 100 degrees hot, with a dry wind that’s very reminiscent of a blow dryer. The air conditioner is cranking, and quite frankly so is my mood. 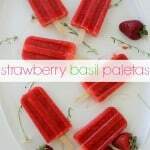 So I think it’s high time to share this paletas recipe. What are paletas, you might ask? Paletas are Mexican ice pops, usually made from pureed fruits. If you’ve ever been in Mexico in summer (or in downtown Los Angeles for that matter) you’ll see a dude pushing a little white cart with a bell attached calling out..paletas…paletas…Which I think can be directly translated into English as…if you have one of these it might be possible to fend off the impending heat stroke and certain death. Friends, these icy treats will save you on the hottest days of summer. And the combinations of flavors are endless–melon & cucumber, blueberry & thyme, lime & mint…and for today, strawberry and Thai lemon basil. Basil + strawberry is one of my very favorite flavor profiles. 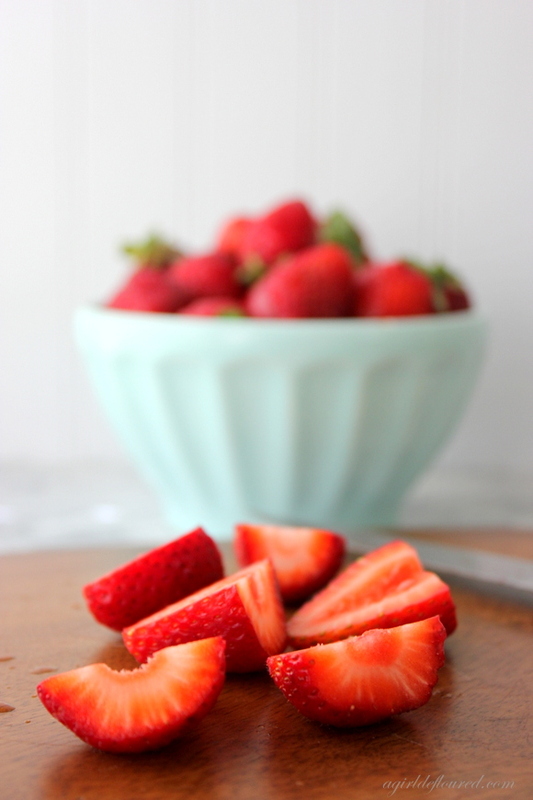 The basil brings out the very essence of the strawberry, making it taste even more like itself. Regular basil is fine too, if you can’t find Thai lemon basil (I get mine from the farmers’ market). It’s pretty hard to go wrong when luscious berries are infused with bright herbaceousness from the basil. I’m thinking that later I’ll chunk one of these bad boys up and stir in a little tequila…or vodka…or even prosecco, and eat it with a spoon whilst on my rocking chair in the shade of my front porch. Happy Summer! I love the bright flavors of strawberry + basil in these fruity, frozen treats. Use any leftover simple syrup to make a strawberry basil martini, or to macerate freshly sliced strawberries which can be served over ice cream. Heat sugar and water together in a saucepan over medium high heat until the sugar is completely dissolved, about 5 minutes. Remove from heat, add the basil and steep for 30 minutes. Meanwhile stem and halve strawberries and puree in a blender or food processor. Stir in 1/2-3/4 cup basil simple syrup (strained to remove the basil), to taste. Pour into pop molds and freeze for 20 minutes. Insert sticks and freeze until solid, at least 3 hours. This entry was posted in Appetizers & Snacks, Dairy Free, Desserts, Kid Zone, Quick & Easy, Recipes, Recipes & Techniques by Cooks We Love and tagged A Girl Defloured, Alison Needham, celiac disease, dairy free, g-free, g-free diet, gluten free, gluten free cooking, gluten free dairy free, gluten free diet, gluten free food, gluten free holiday, gluten free mommy, paleta, popsicle, vegan. Bookmark the permalink.